There were also 10 sport fishing boats off the coast of this mile. California Sea Lions (CSLs)-according to Shoreline Education for Awareness (SEA) wildlife interpreters I spoke with yesterday, the numbers have just gone up as a result of CSLs returning from the breeding grounds. 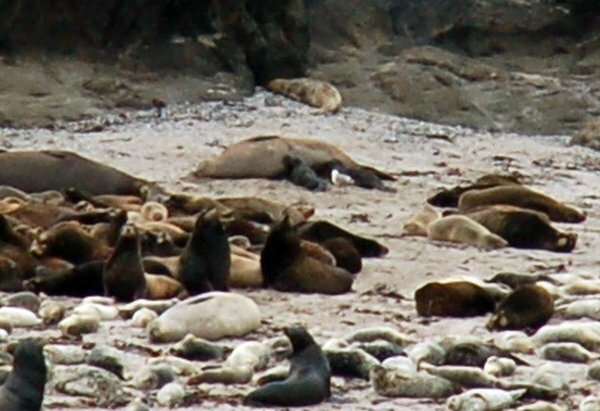 3 female N. elephant seals, Stellar seal lions, harbor seals and 1 gray whale. 2 Bald eagles, 1 osprey,1 turkey vulture. Also Pacific loons and Pigeon guillemots (Note-a Golden eagle was seen 2 days ago). I saw a total of 5 people. Two were hiking with 3 dogs. The other two were watching wildlife. In addition there were 10 sport fishing boats.According to Shoreline Education for Awareness wildlife interpreters that I talked to yesterday, the California sea lions have just started returning from the breeding grounds. There were 3 female N. elephant seals going through their molt on Shell Island. Stellar sea lions, Harbor seals, and 1 gray whale were also observed. I observed 2 Bald eagles (the SEA folks saw a golden eagle 2 days ago), 1 turkey vulture, and 1 osprey as well as Pacific loons gulls, and pigeon guillemots.Physically the area was normal. There was some styrofoam and 3 small timbers on the beach. I was unable to tell if there was any chance any of it came from Japan.